It is now generally recognized that the field of combinatorics has, over the past years, evolved into a fully-fledged branch of discrete mathematics whose potential with respect to computers and the natural sciences is only beginning to be realized. Still, two points seem to bother most authors: The apparent difficulty in defining the scope of combinatorics and the fact that combinatorics seems to consist of a vast variety of more or less unrelated methods and results. As to the scope of the field, there appears to be a growing consensus that combinatorics should be divided into three large parts: (a) Enumeration, including generating functions, inversion, and calculus of finite differences; (b) Order Theory, including finite posets and lattices, matroids, and existence results such as Hall's and Ramsey's; © Configurations, including designs, permutation groups, and coding theory. The present book covers most aspects of parts (a) and (b), but none of ©. The reasons for excluding © were twofold. 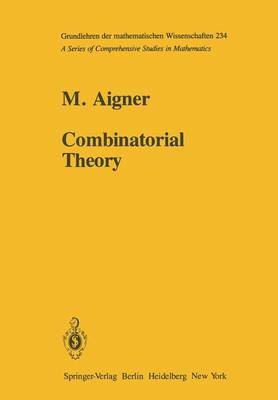 First, there exist several older books on the subject, such as Ryser  (which I still think is the most seductive introduction to combinatorics), Hall , and more recent ones such as Cameron-Van Lint  on groups and designs, and Blake-Mullin  on coding theory, whereas no compre- hensive book exists on (a) and (b).